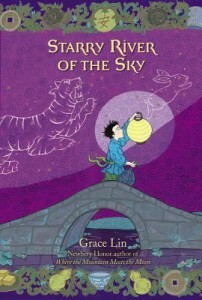 In another lovely children’s book, Grace Lin deftly weaves a dramatic story around the retelling of a number of classic Chinese tales. It becomes almost impossible to tell which are the tales and which is the story, and in the end, they all become one. In her earlier children’s book, When the Mountain Meets the Moon, the overarching theme is gratitude. In this book, the theme is forgiveness. Everything about this children’s book feels slightly surreal, even as the bits of classical wisdom come pouring out. The character of Madame Chang is especially magical, and not surprising in the end to discover who she really is. The ending of the book requires profound contemplation, and in fact, I’d advise parents to read it before sharing this children’s book with young people. Is it possible to forgive even under the worst situations? The boy’s father appears to have no redeeming qualities, and yet, true to Confucian family values, even the worst family must be forgiven and loved. That’s a tough prescription. I am not disagreeing with it. I’m just saying, it’s tough. This book provokes serious contemplation on the practice of forgiveness. It could be effectively used in a classroom or SEL program within a school or rehab situation for young people. Nice book for boys, as the main character is a young lad with issues with his father.